New Orleans Marriott at the Convention Center has the ticket for masterful meetings. The New Orleans Marriott at the Convention Center has your ticket to a masterful meeting. Simply hold a meeting on the Value Dates between June 1 and December 31, 2008 and every member of the group will receive a choice of complimentary incentives. This New Orleans business hotel knows that the secret to hosting successful meetings is happy guests, and happy guests are created through the thoughtful and personalized services provided by the Marriott, such as the professional event staff who work with meeting planners to provide sophisticated and successful meetings, conferences and events. With over 24,000 square feet of total meeting space available throughout the hotel, the Marriott hotel in downtown New Orleans has an array of different spaces available. Meeting planners have the choice of 18 meeting rooms, the largest being the Blaine Kern Ballroom, with a maximum seating capacity of 900. The on-site restaurant, Wolfe's in the Warehouse is also an elegant location for business meetings and corporate discussions over classic Creole cuisine prepared by celebrity chef Tom Wolfe. To book your next meeting, call (504) 613-2840 or to submit an express RFP, visit legendaryneworleansmeetings.com. The New Orleans Marriott at the Convention Center is located in the Warehouse/ Arts District, across the street from the Convention Center and Port of New Orleans, as well as within walking distance to the French Quarter, Harrah's Casino, and the city's finest shopping and dining establishments. Housed in a former cotton mill from the mid-1800's, this riverfront hotel in New Orleans combines classic antiques with modern amenities and trendy décor. Luxurious accommodations are the standard, as well as fine dining at Wolfe's in the Warehouse, which serves exceptional Creole cuisine prepared by celebrity chef Tom Wolfe. 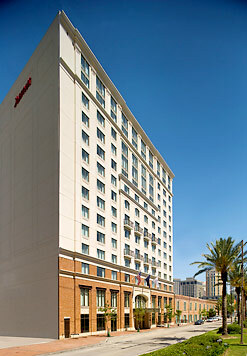 Let the New Orleans Marriott Convention Center Hotel exceed all of your expectations. For more information or to make a reservation, call 504-613-2888, or visit http://www.marriott.com/hotels/travel/msymc. *ADMIT ONE:Planners must ask for promotion when requesting date and space availability. To receive tickets, meetings must be held on Value Dates between June 1, 2008 and December 31, 2008. The promotion is not valid for meetings previously under negotiations or definite. Cannot be combined with any other group offers or promotions. Planner to determine group s ticket selection upon signing contract. Qualifying events include meetings with at least 100 or more rooms on a single night of the event. To book your next meeting, call (504) 613-2840 or to submit an express RFP, visit legendaryneworleansmeetings.com.